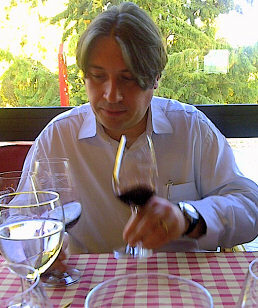 If the phrase ‘triumphing against the odds’ applies to winemakers anywhere in the world, then surely it is in Lebanon. The obstacles they face are not viticultural, for Lebanon is a paradise for grape growing with its limestone soils, high altitude vineyards and near perfect climatic conditions. But this tiny and strategic country sits in one of the world’s most troubled areas, engulfed by the currently chaotic state of Syria to the north and east and, with huge unease, sharing its southern border with Israel and the Golan Heights. It is impossible to write about Lebanon’s wines without acknowledging the context in which its winemakers work. As recently as 2008 an internal conflict saw Hezbollah seize western Beirut and the deaths of over 80 people. Two years earlier, a short but intense war with Israel inflicted tragedies on both sides. Shells pounded Lebanon, killing over 1000 people. But all of that is as nothing compared to the civil war that raged from 1975 to 1990 and the infamous kidnapping of Terry Waite, John McCarthy and Brian Keenan. So much of Lebanon was destroyed, with at least 150,000 lives lost and hundreds of thousands wounded. Today large tracts of Lebanon are under Hezbollah control. Tensions are growing with the situation in Syria and fears that Israel or the US may strike against Iran’s nuclear installations prompting all-out-war in the region. The country’s government is also plagued by interminable deadlocks. Made up of a complex alliance of multiple factions, the constitution demands that the President must be a Maronite Christian, the Prime Minister a Sunni Muslim, the Speaker a Shi’a Muslim and so on, covering all major cabinet posts. The concept is to share power and responsibility, but the factions hold such extremely opposed views that progress is difficult. The 2006 harvest was brought in by office workers, cleaners, executives and lorry drivers as grape pickers could not be found, the war with Israel having raged throughout the summer. At Château Ksara, a neighbour’s tractor filled with new irrigation pipes was mistaken for something more sinister. A rocket strike destroyed it and much around it, doing considerable damage to the winery. The harvest went ahead, the wine was made. Life went on. Lebanon is a country of enormous riches, including the extraordinary temples of Baalbek (pictured above), its stunning Mediterranean coastline, its dramatic snow-clad mountains and the rich, rolling beauty of the Bekaa Valley itself. Beirut is a bustling, modern city too with its slick new waterfront and much of its historic downtown preserved. But it is the warmth, hospitality and inquisitive friendliness of the Lebanese people that so impresses. Every meal is a banquet and a cause for celebration, washed down with local wines and a glass or two of Arak. And what food: an abundance of fruit, vegetables, fish and seafood borrows from both Arab and French roots, as exemplified by the unique café Tawlet, part of the Souk el Tayeb farmers market, where each day a different cook from one of Lebanon’s villages cooks exemplary local food from local ingredients. Lebanon has reasons to be optimistic. Lebanon is an ancient and beautiful country sitting in a glorious position on the shores of the eastern Mediterranean sea. With a population of less than four million people it is a small and largely agricultural land, its landscape very unlike its Middle Eastern neighbours. Dominated by two large mountain ranges that run the length of the country, the coastal Lebanon range and interior Anti-Lebanon range, it is the fertile and high Bekaa Valley in between where most farming takes place. The Bekaa floor is at over 900 metres, with most vineyards planted between 1000 and 1200 metres, making it very similar to Mendoza in Argentina. The summers are hot, especially when hot winds from the gulf or Egypt sweep over, but because of the altitude nights are always cool. Though summer temperatures can hit the 40s, a diurnal shift between 30C and 10C is typical of the Bekaa Valley summer. Rain rarely falls between April and September, but there is generally a good water supply from both wells and snow melt. Winters are harsh, with low temperatures and heavy snowfalls, but the thermometer rarely falls to vine-damaging levels. Soils in the Bekaa tend to be on a base of limestone, topped by clay or loam, occasionally with lots of stones and gravel or in other places rich terra rossa. But the Bekaa is not Lebanon’s only wine region. Towards the coast way to the north, the hills of Batroun are now home to several boutique wineries, whilst there are established players around Jezzine to the south too. Generally speaking, all wineries will source some of their grapes from the Bekaa as well as their immediate surroundings, and Chateau Ka has planted all of its vineyards over in the Hezbollah region of Baalbek. The history of winemaking in Lebanon goes back thousands of years, but the modern era began in 1857 with the arrival of Jesuits from France who established what is now Château Ksara. They planted Cinsault, trained in free-standing ‘gobolet’ bushes. The goblet-shaped canopy of leaves protecting the grapes from sun and helping retain moisture. A second wave of other Mediterranean grapes, like Grenache, Carignan, MourvÃ¨dre and Syrah followed, and in the last 20 years or so a rush to plant Bordeaux varieties, mainly Cabernet Sauvignon, but Merlot, Cabernet Franc, Petit Verdot and Malbec too, as well as recent plantings of Carmenère. For white wines, Chardonnay, Muscat, Sauvignon Blanc and Sémillon are widespread, but Viognier is increasingly important. Some vineyards are now trained on wires, depending on variety and site. All vineyard work is by hand. Native grapes Merweh and Obaideh are mostly reserved for the production of Arak, the spirit delicately flavoured with green anise that is still a vital part of Lebanon’s culture. Almost all wineries distil and bottle Arak as an important part of their business. The photo, left, shows Arak ageing in hand-made clay jars, produced in the Bekaa village of Beit Chama by one septuagenarian potter, who can produce only 100 jars per year, each one taking eight months to complete. In rare cases these grapes are being used for wine too, most notably at Château Musar, where they constitute the blend for its white wine. 1992: With a fragile peace, the development of the modern wine industry resumes. In wine terms Lebanon’s famous Bekaa Valley has always been an agricultural oasis: Lebanon is no desert state, with the high mountains at an average of 2000 metre snow-capped throughout the winter months, providing not only some excellent skiing, but some protection from the rains and hot winds coming from the coast. Whilst the beaches of Lebanon enjoy a balmy Mediterranean climate, on the other side of the mountains the Bekaa is much more continental, with very hot, dry summers and seriously cold winters. In 1930 Gaston Hochar founded Château Musar in the cellars of the 17th century Mzar castle in Ghazir, overlooking the Mediterranean sea. What started as a hobby became a passion after he met Ronald Barton of Bordeaux’s Château Langoa-Barton in 1941 when Ronald was stationed in Lebanon during World War II. Today, over two million bottles lie in the castle under Musar’s regime of holding massive stocks and releasing wines only when they see fit. Winemaking has moved to larger premises immediately behind the castle. I was greeted by Serge Hochar (right), Gaston’s son who joined the business in 1959 having studied oenology in Bordeaux. Also present was brother Ronald who joined in 1962 and Serge’s son Gaston, one of the generation of younger Hochars who will one day run the business. Though dwarfed by Châteaux Ksara and Kefraya, Musar is a big player by Lebanese standards producing around 700,000 bottles annually. Since 2006 much of their vineyard has been certified organic, though Serge points out that the Bekaa is so remote and unspoilt that the vineyards were basically ‘organic’ by default before the term was coined. All the grapes are hand-harvested by local Bedouins, and in the winery ambient yeasts are used for fermentation with the bare minimum of sulphur. The wines are neither fined nor filtered. Musar’s wines are idiosyncratic. For all their global fame and following, they really are not representative of Lebanon’s wines, marching as they do to their own distinctive beat. 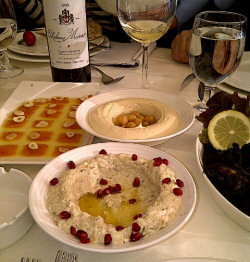 The white wine, for example, is made from Merweh and Obaideh, whilst others rely on Muscat, Viognier and other French varieties. The red is a blend of equal parts Cinsault, Carignan and Cabernet Sauvignon whilst most others have homed in on Cabernet and Syrah. There is also the question of Musar’s style, and whether or not these wines show acceptable levels of volatile acidity and oxidation. Some criticise the wines as faulty, but that is failing to understand these wines. The family will not release them until their 7th year at the earliest (2003 is the current commercial vintage) and insist they need 15 years to show their best. Those wild aromas and flavours are there, but they are the essence of the exotic, spicy, other-worldly fascination of Musar when properly aged and drunk in perfect condition. This is truly one of the world’s most idiosyncratic, but also most exciting wines and wine estates. 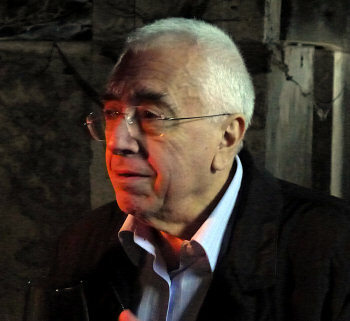 Note: sadly, Serge Hochar passed away in 2014. Château Ksara is Lebanon’s oldest winery, founded in 1857 by French Jesuit priests. It is also a household name in the Lebanon thanks to being the biggest producer (close to three million bottles annually) anda such a prominent presence in every shop, restaurant and café for its wines. I met up with Ksara’s charming M.D. 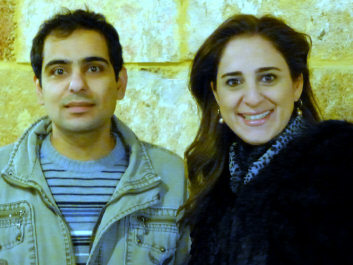 Elie Maamari (right), who took us deep into the historic caves beneath the winery and explained Ksara’s history. 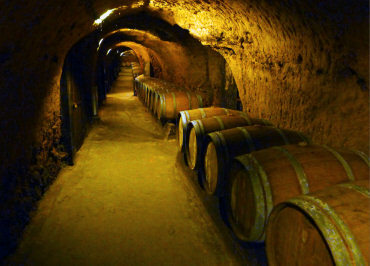 The Jesuits planted French vines, almost exclusively Cinsault, as well as developing two kilometres of original Roman caves beneath the winery and vineyards. Pictured, Elie holds a bottle of 1937 white wine that we went on to taste later that morning. The Jesuits sold the winery to the four families who currently own it in 1972, and there has been investment since to make Ksara one of the most modern wineries in the country. Ksara farms 348 hectares of vineyard in the Bekaa Valley, without the use of chemical herbicides. Château Ksara (built on the site of an old ksar or fortress) has around 37% of both the domestic and export markets for all Lebanese wines. Today they grow Cinsault, Carignan, Grenache, Syrah, Mourvèdre, Merlot,Cabernet Sauvignon, Cabernet Franc, Petit Verdot, Gamay, Tempranillo and the local Arinarnoa. Southern French cross-breeds, Marselan and Caladoc are also grown and for white wines there is Muscat, Ugni Blanc, Sauvignon Blanc, Semillon and Chardonnay. Soils in their six vineyard sites include chalk, red clay and limestone, with the 43 hectares at Kanafar the first in Lebanon to be trained on wires. This is a wine estate with a rich history and it welcomes visitors (70,000 of them last year) to see the winery and cellars. The cellars tell fascinating tales: the entire Roman system had been grown over and concealed, and was only re-discovered by the Jesuits when a brother chased a fox that had stolen a chicken, and disappeared into a concealed opening. The tunnels also housed 400 families during wars with Ottoman occupiers, when more enlargement took place. One of the highlights of my trip was an afternoon and evening spent with the Touma family of Château St Thomas, including a fabulous multi-course dinner ‘en famille’. Founded in 1990 by the irrepressible Saïd Touma (a high-fiving, ultra-gregarious five-foot-nothing whirlwind of hospitality), the original focus was Arak as Saïd has 50 years’ experience in its distillation, with both his father and grandfather important producers of Arak in their day. Saïd gave us a masterful demonstration of how to determine the quality of Arak and prepare the perfect Arak drink. Today the gentle, thoughtful but completely switched on Joe Touma (Joe and Saïd pictured) is winemaker and has established St Thomas as one of the best and most adventurous estates in the country. Château St Thomas is located on a hill overlooking the Bekaa Valley at an altitude of more than 1000 metres. Its 65 hectares of vineyard on the eastern slope of Mount Lebanon have grown grapes to make wine only since the 1998 vintage. 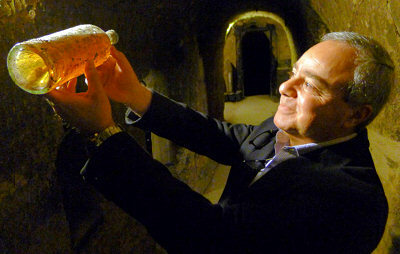 The wines are aged in the caves beneath the winery, dug through rocks to a depth of 30 meters by Saïd. One wonders if the family had any such doubts over one of their more recent innovations: being the first Lebanese winery to grow and bottle a mono-varietal Pinot Noir. It must have taken an enormous leap of faith to attempt this, in a climate with such roasting summer temperatures, and yet Joe has fashioned two vintages so far of Pinot that is full of expressive character. A full range of other French varieties are grown too. Château St Thomas welcomes visitors to its humble winery and there is plenty to see including a chapel dedicated to St Thomas and the cellars carved directly into the rock. The winery motto is “Il faut en boire pour y croire”, or “you have to drink it to believe it,” which elegantly sums up this fascinating and high quality domaine. 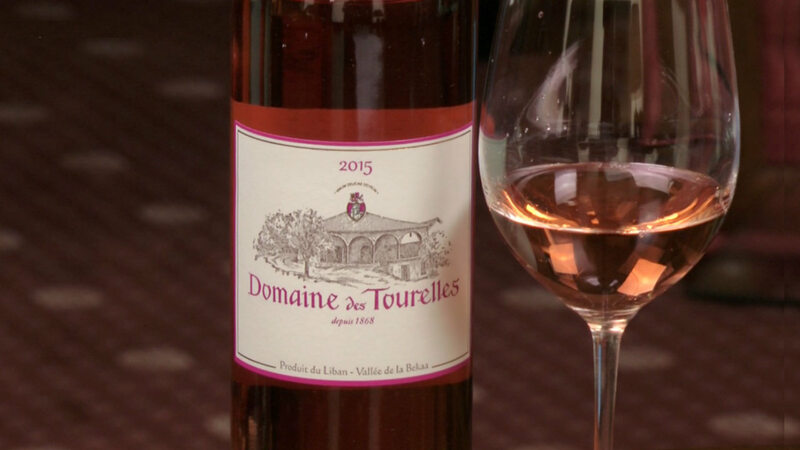 Domaine des Tourelles is one of Lebanon’s oldest wineries, founded in the 1860s by a young French engineer named François-Eugene Brun. 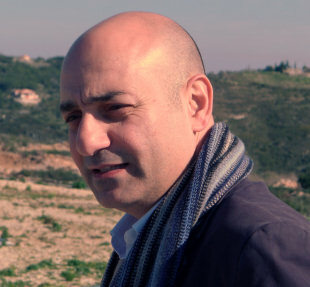 Based in Lebanon to work on building the Beirut to Damascus road, he settled in the village of Chtaura, said to have reminded him of his birthplace in southern France. In 1865, at the age of 24, he planted a vineyard on a plot of land next door to the village house of his boss on the engineering project. 1868 saw his first vintage. Having married a French woman living locally, François-Eugene went on to have five children, and successive generations of Bruns continued at the Domaine until 2000, when Pierre-Louis Brun died without children. Relatives were sought amongst the Lebanese Diaspora, and eventually the Domaine (which had other established Lebanese estate’s queuing up to buy it) was sold to two families, Nayla Kanaan Issa-el-Khoury and Elie F. Issa. 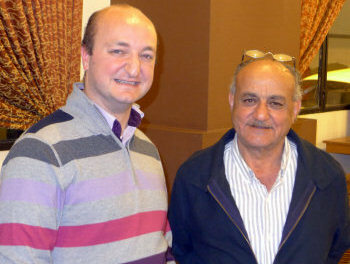 The Issa’s children lived in the village and had grown up knowing ‘uncle Pierre’ and today two of them, Christiane in charge of marketing and Faouzi in charge of winemaking run the domaine along with Emile Issa-el-Khoury (left of picture). The two families farm the 20 hectares of vineyard around the winery in the village of Chtaura, plus another 80 hectares under contract. Christiane talks fondly of ‘uncle Pierre’, and proudly points out two old, browning and faded certificates on the wall – a gold medal in Paris and Bronze medal London both from the 1890s, and the first international medals for Lebanese wines in competition. Walking through the vineyards, still under a foot of snow from recent storms, Faouzi tells me he trained in Oenology at the University of Montpellier, as did founder François-Eugene Brun. One of his main projects has been choosing the terroir carefully for each variety: “Grapes like Cabernet need longer hanging times, with gravels over clay to retain some water.” With dry summer weather and little disease, he does not use synthetic chemicals. Château Kefraya is another major estate of the Bekaa Valley, farming 121 hectares on the foothills of Mount Barouk, 20k south of the town of Chtaura. The vineyards are planted in a series of terraces and slopes, at an altitude between 950 and 1100 meters. The soils are clay-limestone, some very rocky. It is an estate that is very well set-up for visitors, including an excellent restaurant. The winery is truly state-of-the-art, including optical automatic sorting of grapes and full temperature control: it is perhaps the most modern and technically well-equipment winery I saw on my tour. Kefraya was established in 1951 by its owner Michel de Bustros, the winery built on a man-made hill constructed by the Romans to house a fort. The fallow land was ploughed and rocks blasted to create the terraces and the largest contiguous vineyard in Lebanon. Kefraya only sold its grapes until 1979, before starting to make wine. Today they take grapes from a total of 430 hectares in the Kefraya region, including contracted vineyards under their total control. I met up with French winemaker Fabrice Guiberteau (pictured), who arrived here via a very circuitous route during the 2006 war when Beirut was a no-go area. Fabrice explained that there is no irrigation at Kefraya – it is all dry farmed. “It is important to make each vintage according to the rain and vintage conditions,” he says, and whilst farming is not organic, synthetic chemicals are rarely used and only as a last resort. Forty percent of the vineyard is trained in free-standing gobolet, with 60% on wires though by world standards planting is not dense at 3.3 thousand plants per hectare. “Vinification is basically ‘Bordelais’,” says Fabrice using wooden vats of 6000 litres and steel vats of 15000 litres (replacing much bigger steel tanks since he arrived). Though Mr de Bustros was not there on my visit, his personality is everywhere. His love of opera and the arts is celebrated, including on the bottles: each year the white wine is named after an operatic heroine, whilst the label is from an original work by a Lebanese woman artist. From the acres of immaculately tended gardens, to the fine restaurant, to the gallery of Lebanese art, it is clear that having hewn his vineyards from the rocks and built his business through a period of great uncertainty for the country, Kefraya is his personal vision realised. 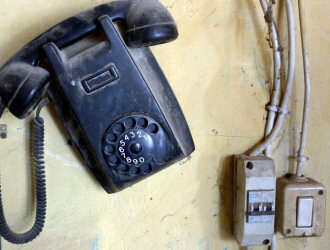 (Photo courtesy Château Kefraya). This was a visit full of interest. Château Ka is a tiny part of a huge fruit juice, jam and alco-pop production plant belonging to the Kassatly family (whose products are a household name in Lebanon). Though current owner Akram Kassatly “realised a dream,” when he launched the winery next door to the beverage factory in 2005, in fact his father, Nicolas Kassatly, had established a wine operation as far back as 1919. Indeed, Akram’s own attempts to establish a winery had more than one false start. I met with Akram’s daughter, marketing manager Ghida Kassatly and young winemaker Jean Tannoury (pictured), who trained at Dijon wine school in Burgundy as had Akram in 1968. They told me the story of how Akram returned to Lebanon from France and together with his brother bought a vineyard in the village of Chtaura and spent five years building up a business. Their first release under the Kassatly Chtaura label was in 1974. However, that year also saw political tensions rise in Lebanon and within a year the destructive 1975 – 1990 civil war had broken out, leading to the virtual breakdown of Lebanon with the militia looting the winery and destroying the tanks. It was not until the war ended in the early 1990s that the Kassatly’s slowly began to rebuild the business, but this time taking a strategic decision to make fruit beverages, syrups and carbonated drinks as a “less costly and less risky investment.” In fact, the new Kassatly Chtaura business was so successful that in 2005 Akram had the courage to start producing wine once again. Initially buying a few acres of vineyard around the winery, production has gradually increased through contracts with local farmers and vineyards, ramping up production to 500,000 litres, quickly making them one of Lebanon’s bigger players. Today, 75 hectares of their own vineyards have been planted and these are now estate wines with no bought-in fruit. Almost all of the plantings are deep in Hezbollah territory around the temple of Baalbek, and I asked Ghida if this presented any problems. “many of the farmers working for us there are Muslim,” she told me. “Indeed all of our employees are Lebanese, which helps be accepted in the Hezbollah area.” “But it is no problem growing grapes there,” confirmed Jean, “There is no fermentation or wine making, just farming.” As we walked around the winery I noticed that all of the barrels for ageing are larger 300-litre barrels rather than the 225-litre size of Bordeaux. Jean confesses that he is toning down his use of oak, with shorter maturations too. 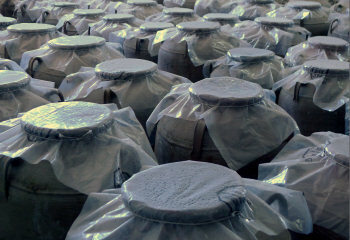 The vast majority of barrels are French oak, with a little American too. Château Ka is one of three wineries (along with Château Ksara and Domaine des Tourelles) who will have a wine stocked by Marks & Spencer from May 2012, a source of obvious pride for Ghida and Jean. The long, elevated Bekaa Valley that runs southwest to northeast between the Lebanon and Anti-Lebanon Mountains is by far the most important vineyard area in Lebanon. Around 90% of all wine production emenates from there, and almost all wineries take fruit from there. But there are a few other sizeable pockets of grape growing, some on the opposite slopes of the mountains towards the coast to the north, some much further south towards the border with Israel and some in the east, closer to the Syrian border. My visit took in two wineries from these regions, travelling north from Beirut to the historic port of Byblos and, above it, the hills of Batroun which are now home to several boutique wineries including big money start-up, Ixsir. To the south around Jezzine, Château Karam has pioneered a modern wine industry though more growers are now operating in the area. As discussed above, Château Ka has planted all of its vineyards in the Hezbollah-controlled Baalbek area, though again others are now growing wine grapes there too. Hady explains that growing grapes here on the western slopes of the Lebanon mountains has an ancient history: “Grapes have been grown here for 1000 years, but that stopped in 1500s when the Ottomans ruled and the mountain vineyards ceased production completely.” The Lebanon ranges averages 2000 metres, and Ixsir has vineyards all over the valley and the hillsides. 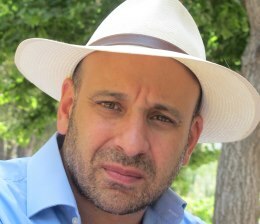 “Our Syrah comes from one of the highest vineyards in Lebanon at 1800 metres, planted into pure limestone rock with more or less no top soil,” Hady tells me. 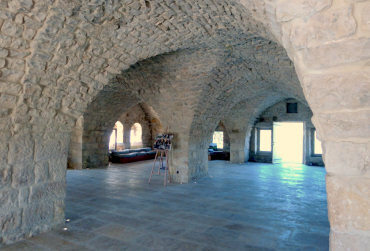 Today there are seven wineries in the Batroun region. “Everybody knows the Bekaa,” says Hady, but Ixsir is focused on this area: the initial six hectares of planting will be expand in time as one of the estate’s owners has substantial land in the area. They have planted at a density of 7000 plants per hectare, whilst the Lebanese average is closer to 3000. The hillside is limestone, and the only problem Hady can foresee is the “50 winds”, hot summer winds blowing from the desert that in 2010 saw 40% of the grape crop lost as temperatures topped 40ºC for three solid weeks. The Karam winery is a boutique project producing only around 60,000 bottles. It is the only winery based in the south of the country with its vineyards in the Jezzine area. However, this is another historical vineyard region with records of viticulture here going back to pre-Roman times. The winery is the joint venture between two brothers who grew up on an ancestral vine estate. Elder brother Habib (pictured with his family) is the driving force. The senior pilot with Middle East Airlines by day, he says that “after frequently gazing down on the vineyards I decided to realise my dream of winemaking.” Habib’s younger brother Ousama is a grape, fruit and wine importer and distributor in the USA. The Lebanon mountain vineyards are around an hour and a half’s drive south of Beirut. At an altitude of 1400 metres, soils range from hot, dry gravel to moist loam. As pioneers of modern day winemaking in Jezzine, the Karam brothers thirst for adventure and risk-taking means this is also one of Lebanon’s most experimental estates too. As well as growing the palette of Bordeaux and Southern French grapes like Muscat, Viognier, Semillon and Sauvignon Blanc for whites; Cabernet Sauvignon, Syrah, Merlot and Petit Verdot for reds, they have also planted Albariño, Touriga Nacional and Graciano. The packaging and branding is equally quirky, with “Cloud Nine” and “Arc-En-Ciel” playfully referencing Captain Karam’s alter ego. Sadly a travel scheduling problem meant I could not make the journey down to Habib Karam’s winery, so the six wines reviewed below were delivered to Beirut for me to taste. A visit to Karam is a must for my next visit to Lebanon. Whether or not Lebanon’s winemakers will have the peace and stability to allow the rapid expansion and improvement of the past 20 years to continue is a question only time will answer. But I returned from this week filled with enthusiasm for the country and the people, and certain that this viticultural paradise has the raw materials, in earth, grapes and people, to make great wine. Given it is such a young industry, mistakes have undoubtedly been made – too much oak in top cuvées, some indiscriminate planting of varieties without fully understanding the terroir – but Lebanon is a wine country full of hope, opportunity and promise.